With the integrated SIP compatible softphone, you can conduct VoIP phone conversations with external and internal participants at the Windows workstation and in the smartphone app, whether in the office or on the road. Users can decide whether they want to use a normal "classic" telephone or a headset directly from the PC. We supply two lines; the customer has the choice. Two SIP lines, an SIP line and a classic telephone line, or two classic telephone lines if they don’t want the softphone functions. 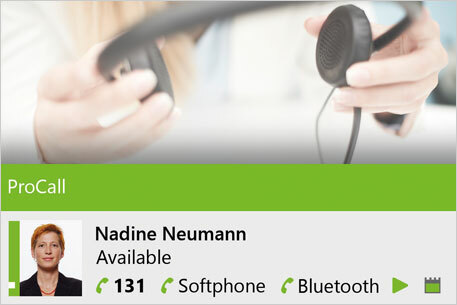 A number of selected softphone functions have already been released on a variety of telephone systems. The following functions are supported by ProCall 6 Enterprise, other functions are planned. Connection to the following telephone systems has been tested and approved by estos. Your phone system is not there?